A torn meniscus is a very common knee injury for athletes and non-athletes alike. Contact-sport athletes are particularly at risk for meniscal tears, but they can happen to anyone at any age. The treatment for a torn meniscus in Los Angeles is not only depends on the severity of the injury, but the location of the injury on the meniscus. If the injury is minor to moderate, and in an area of good blood flow, then the tear may be able to heal somewhat, on its own, with time and rest. However, if the tear is in an area of the meniscus that receives poor blood supply, the meniscus will not be able to heal on its own even given time and rest, and may continue to cause pain and discomfort and require surgical intervention. Many times, a torn meniscus is sustained along with other knee ligament injuries (i.e. ACL injury). This happens a lot during sports activities when players twist a knee or the knee absorbs direct contact such as during a tackle in football. In these cases, arthroscopic knee surgery will probably be needed to repair several damaged parts of the knee. In addition to athletes, older people can be more likely to suffer meniscus tears than the general population. The main difference is that their injuries are referred to as degenerative meniscal tears. It is possible for meniscal cartilage to weaken or thin over time, and aged or worn tissue is prone to tearing. Even a minor knee twist might be enough to cause a torn meniscus in older people with weakened cartilage. Failure to properly treat a meniscus tear could cause the knee to slip, pop, or lock, if a piece of cartilage were to come loose and drift into the knee joint. Whenever anyone suffers torn cartilage in the knee, they have most likely torn their meniscus. Three bones (thighbone, shinbone, and kneecap) converge to form the knee joint, and the menisci (plural for meniscus) serve as shock absorbers between the thighbone and shinbone. The menisci are discs of cartilage that often have the shape of crescent moons inside the knee, which provide shock absorption for the knee joint. These C-shaped cushions of cartilaginous tissue bear a lot of weight and motion stresses from athletic and everyday movement, which can make them vulnerable to tearing or “fraying” if people are not careful. The meniscus is well-suited for the job it does, but the forces of movement are so variable that even the most healthy knee and its menisci can tear under everyday conditions. Twisting the knee while the foot is planted on the ground can cause the meniscus to tear. A blow to the knee or a forceful impact such as a jump and heavy landing upon the ground can also cause tearing of the meniscus. Kneeling and twisting with weight upon the knees, such as during gardening, cleaning, or other household activities can also damage the meniscus. Even getting out of the car hastily, causing your knee to twist, can damage the structures of the knee. The meniscus can tear in several different ways. Orthopedic surgeons classify tears in two ways: (1) how the tear looks and (2) where the tear occurs in the meniscus. Many patients experience a popping sensation when tearing their meniscus. The injured knee can either swell up right away or become stiff and swell up over a period of two to three days after the injury. Symptoms can vary in severity from person to person. Even with a torn meniscus, most people can still walk and put weight on their injured knee, and some athletes can even keep playing on a torn meniscus. Others, however, cannot. Orthopedic surgeons begin diagnosing a knee injury by discussing the symptoms and medical history of a patient, to attempt to discover how the injury could have occurred. Then the doctor will examine the knee, checking for tenderness along the joint line where the meniscus is located. If that area is indeed tender, then the knee injury may be a meniscus tear. For Dr. Meier in Beverly Hills, meniscus tear surgery is first diagnosed by testing the function and response of the patient’s knee to help confirm a diagnosis. Also, since other knee problems can cause similar symptoms to meniscal tears, your doctor or orthopedic surgeon will usually schedule one or more imaging tests such as an MRI or X-ray to get a better view of the knee and what the problem might be. If none of these serve as confirmation of a diagnosis and the patient still has significant symptoms, the orthopedic surgeon could also schedule a surgery or meniscus transplantation in order to have a direct look at the knee and get a definitive answer regarding the diagnosis, as well as fix the problem while he is in there. The treatment for a meniscal tear can depend on many things, including the type of tear, its location, and its size. Age, activity level, and any other related injuries will also factor into your meniscal tear treatment plan. The outer third of the meniscus has access to a rich blood supply. As a result, tears in this location may often heal without knee surgery. Conversely, the inner two-thirds of the meniscus does not have access to that type of blood supply nor the nutrients that accompany it. Therefore, tears to this portion of the meniscus cannot heal without help. Rest means that patients should rest the injured body part as much as possible. Patients may be asked to use crutches or avoid weight bearing on the injured leg. Ice means that patients should use ice the injured area, though not directly on the skin, for 20 minutes, several times a day. Compression can involve the wearing of an elastic compression bandage (i.e. Ace Wrap) to prevent additional swelling and provide support for the weakened area. Elevation refers to literally raising the injured body part higher than the heart to reduce swelling. This can be done by lying down on a sofa or bed with the area elevated by pillows. 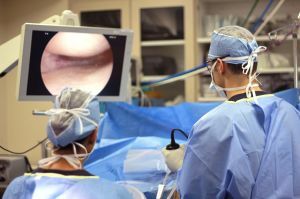 If conservative, non-surgical treatments have been tried, and are not effective at alleviating symptoms, the orthopedic surgeon might recommend arthroscopic meniscus repair to treat a torn meniscus. 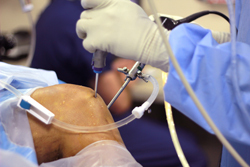 Arthroscopic knee surgery is a very commonly performed procedure, and it is also one of the specialties of Steven Meier, MD, Director of Meier Orthopedic Sports and Regenerative Medicine. 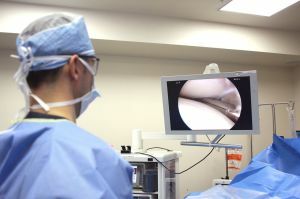 During meniscus repair, Dr. Meier makes two small incisions and inserts a mini camera (arthroscope) into one and surgical tools into the other. This allows the surgeon to visualize the joint and make the necessary repairs without a huge opening that would most likely lead to a more lengthy recovery. If the meniscal tear occurs in thin or already-worn cartilage, these floating pieces of cartilage cannot grow back together, and are not contributing to the stability of the knee, but still cause pain due to residual innervation. Orthopedic surgeons merely trim these pieces away during arthroscopic surgery. Recovery from torn meniscus repair surgery will depend upon the type of procedure that is necessary to fix the problem. Once the initial healing is complete, patients will begin a physical therapy rehabilitation program with exercises designed to gradually improve both knee strength and range of motion. Meniscal tears are very common knee injuries. With proper treatment, proper diagnosis, and proper rehabilitation, most patients can return to their pre-injury abilities within a period of several weeks or months depending on the severity of the tear and their commitment to meniscus rehabilitation in Beverly Hills. medlineplus.gov goes into detail about meniscus repair aftercare. Dr. Meier and his team employ state-of-the-art, minimally invasive, surgical techniques to treat tears of the meniscus. If you require meniscus repair surgery in Beverly Hills and want your knee surgery to be performed by one of the best arthroscopic surgeons in the country, contact our orthopedic surgeons in Beverly Hills today at 310.736.2793 or fill out the contact form on our website. Next, find out how Dr. Meier corrects a Unicompartmental Knee Arthroplasty.